APPLICATIONS: Designed for installation on new roofing using Slate, Tile or Cedar Shingles. Part # 100S-AS is available for Asphalt singled roofs. DESCRIPTION: The Model #100S is designed to fit between adjacent pieces of roof material, so that only the casting is visible above the roof surface. A traditional spike style snow guard, from a design first patented in 1899. The Model #100 is historically accurate for period restorations, but is just as appropriate for new construction or retrofit application on existing slate roofs. Also available is the #200. The #200 spike style snow guard is fabricated from the same sheet metal components as the #100, but the #200 casting is 30% larger than the #100. Both products are equally strong and effective in their capacity to hold snow on the roof, but the Model #200S is more appropriate to larger scale buildings, or where the roof material is thicker than usual, such as tile roofing. #200 Series is available for Soldering - Bronze (200CPSM). #200 Series is also designed for Nailing on New Applications - Bronze for Slate (200S-NA) or Bronze for Asphalt Shingle (200S-AS). 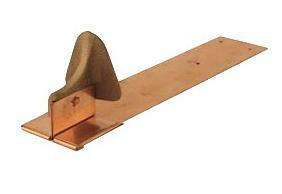 The #200 Series is also available with a Retro-Hook for Existing Slate Roofs - Bronze (200S-RH). The #200 Series is also available with a Hook for New Installations on Tile Roofs - Bronze (200CPT) or Tin Plated (200STP-NA). Because of its low profile, this model is appropriate for residential usage. MATERIALS: The head is cast bronze. The sheet metal installation flange and the vertical casting support are all 24 oz. (7.3 kg/m²) cold rolled copper.